← Let Them Eat Seal! My Pipeline is Better than Your Pipeline! This posting is based on a story in Der Spiegel of February 14. Joschka Fischer was a student radical in Germany in 1967 and participant in several street battles in Stuttgart and Frankfurt. Thirty years later, as head of the Green Party, he was, from 1998 to 2005, foreign minister in socialist Chancellor Gerhard’s coalition government and was widely regarded as Germany’s most charismatic politician. Today Schröder and Fischer are on opposing sides – as lobbyists for two opposing pipeline projects. The former chancellor is working with the Russians: his pipeline is called Nord Stream. The former foreign minister is working against the Russians and his pipeline is called Nabucco and is intended to transport natural gas from Central Asia to Europe without going through Russian territory. Construction is slated to begin next year. The two men are playing a modern-day version of the Great Game, the 19th-century struggle between Britain and Russia over control of Central Asia. This time round, the game involves the energy supply of the future and of a finite resource, natural gas. But when Fischer takes on Schröder, it isn’t just a contest over who has the longest pipeline. In fact, it is only another chapter in the rivalry between two of the biggest egos in German politics, a contest that has been going on for more than a decade and has yet to be decided. Nabucco is designed to make Germany less dependent on Russia. Fischer is paid to promote the project by the German utility giant RWE and the Austrian oil and gas company OMV. The Russian energy giant Gazprom leads the Nord Stream consortium. Schröder is chairman of its shareholders’ committee. The two men endured each other for seven years in government. Now they are fighting over who controls the post-government period. Schröder made himself the target of criticism from many quarters – including the Poles, the Baltic States and Germany’s conservatives – when he supported Nord Stream as chancellor. From his point of view, however, the issue is very simple. Germany imports about 40 percent of its gas from Russia. The Nord Stream pipeline, which leads from Vyborg near St. Petersburg to a point near the northeastern German town of Greifswald, will make Germany independent of transit countries. Once it is built, it will make little difference to the Germans whether the Ukrainians have refused to pay their gas bills and whether Gazprom uses this as an excuse to shut off gas deliveries, as has happened in recent winters. 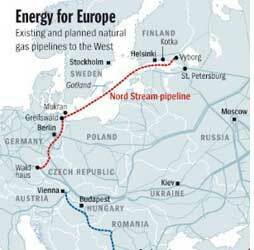 Once Nord Stream is online, gas will keep flowing to Germany whatever happens. To hear Schröder talk about Nord Stream, the project seems to make perfect sense. The fact that Schröder supported the project while he was chancellor was never the problem. The problems only began later. Schröder had hardly been out of office a month before he accepted his position on Nord Stream’s shareholders’ committee. He became a paid lobbyist for a pipeline he had promoted as chancellor. It wasn’t illegal, but many found it objectionable. The Germans don’t like to see a former chancellor swiftly turn into an elder salesman instead of an elder statesman. It still irks Schröder that people see it this way. Most of all, it irritates him that Fischer was long seen as a shining example of everything Schröder was not. In his theatrical farewell to the Foreign Ministry, Fischer ripped off his necktie and rhapsodized about his return to freedom. Unlike Schröder, who tried to hang on to power as long as he could, Fischer immediately accepted the outcome of the September 2005 election, which brought Angela Merkel to power. The press described his departure from office as dignified. Fischer became a visiting professor at Princeton University and wrote opinion pieces in newspapers – the sort of things one might expect from a former foreign minister. For a long time, Schröder seemed a little dodgy compared to Fischer. That’s why Schröder likes the idea that Fischer is now negotiating with Iran on behalf of large energy companies. He hasn’t forgotten what Fischer’s Green Party said about the Gazprom deal at the time, namely that Schröder was committing political folly and that he was behaving improperly and ruining his reputation. Schröder knows that Fischer doesn’t only work for RWE and that he also advises BMW and Siemens. In other words, he derives income from a carmaker and two companies involved in nuclear power plants, one as a manufacturer and the other as an operator. Back when he was environment minister of the western state of Hesse, Fischer was one of the staunchest opponents of the nuclear industry. As vice chancellor, he helped negotiate Germany’s phase-out of nuclear power plants. Fischer downplays his activities, saying that he has nothing to do with the nuclear sector, and that most of what he does today isn’t that different from what he used to do back when he was a politician. He may be right, but nevertheless it’s easy to understand why Schröder is so pleased about Fischer’s new job. “Joschka’s job, as I understand it, is giving foreign policy advice. I don’t see anything wrong with that,” says Schröder, as he puts on a very serious face, trying to hide how gratifying it is for him that he and Fischer now play similar roles. Fischer’s work involves natural gas agreements with countries like Turkmenistan and Azerbaijan, countries with governments that are sufficiently repressive to make Russia look like a democratic idyll. Morally speaking, he and Schröder are now operating at the same level – at least from Schröder’s perspective. All protestations aside, Fischer is Schröder’s competitor. He is back in his element as an international politician, dealing with important matters like connecting Central Asia to Europe and improving relations with Turkey. Schröder, on the other hand, is mainly interested in preserving Russia’s gas monopoly. Schröder chuckles hoarsely. He clearly enjoys the subject. Perhaps the winner of this long-standing battle will emerge within the next year. The construction of the Nabucco pipeline is scheduled to begin in 2011. There are no gas delivery contracts yet, and it still isn’t clear what Turkey’s price will be for allowing the pipeline to pass through its territory. In other words, it is still possible that Schröder’s prognosis is correct and Nabucco will never operate at a profit. On the other hand, it could well be that all of the geopolitical factors Fischer describes so often will fall into place. But no matter what happens, the loser will not accept defeat. The battle of Schröder vs. Fischer will continue. This entry was posted in Uncategorized and tagged Central Asia, Gazprom, Gerhard Schröder, German Politics, Joschka Fischer, natural gas pipelines. Bookmark the permalink. This gets even more complicated. The three little Baltic countries don’t like the northern route. They think it gives Russia too much leverage over Europe. The Economist hinted keeping Russia happy is why France sold Russia an advanced aircraft carrier. A Russian Admiral said with that ship Russia could have defeated Georgia in 40 minutes rather than 26 days. As for natural gas being a finite resource….we’re finding the sutff everywhere in North America. Shale gas is even in Quebec. It has kept the price of natural ags low here, and will probably kill the liquified natural gas market. Not too many towns want a terminal; they might blow up. Since we have so much of it may I suggest that the world follow my wife’s example. I am moving to Barbados. It’s warm there! No heating required.